Eight students were honored during Spring 2013 Commencement ceremonies as the University of Louisiana at Lafayette Alumni Association’s Outstanding Graduates. That overall winner will be announced during the Commencement General Assembly at 11 a.m. on May 18 at the Cajundome. Kylie Dold is the Outstanding Graduate for the College of the Arts. She is an interior design major with a minor in visual arts. She will graduate with a 4.0 GPA. Dold has been on the President’s List, has been awarded the College of the Arts Dean’s Scholar Award, and has earned many other Design Excellence Awards and scholarships. She is a member of Tau Sigma Delta Honor Society in Architecture and Allied Arts, and the student chapter of the American Society of Interior Designers. 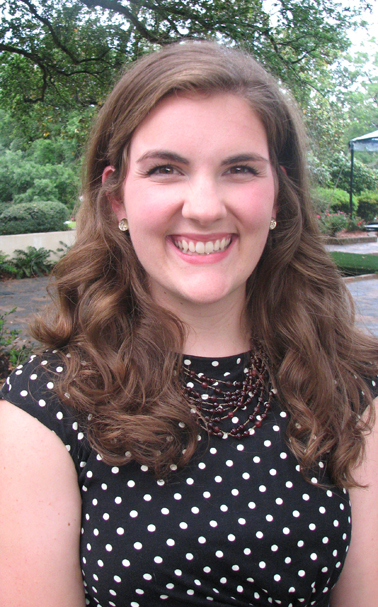 Dold is active in service to the community and University, working as a tutor and with the Family Missions Co., a Catholic non-profit organization based in Abbeville, La. She plans to work as a foreign missionary, and then pursue a graduate degree in historic preservation or interior design. Dold is the daughter of Kent and Jennifer Dold of Abbeville, La. Nadine Bayard is the Outstanding Graduate for the B.I. Moody III College of Business Administration. She is a bu siness management major with a 4.0 GPA. Bayard has been on the President’s List and has received numerous scholarships, including the Edward “Ted” L. Kibbe Endowed Scholarship, Oran Robert Perry Burke Memorial Scholarship and SGA International Scholarship. 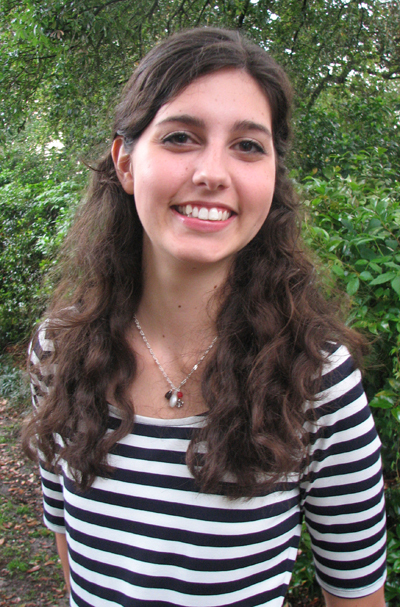 She is a member of UL Lafayette’s Honors Program and Phi Beta Delta Honor Society for International Scholars. Bayard has served as vice president of Chi Alpha Christian Fellowship and is a member of the Latin American Student Association. She has been a volunteer for Heart Walk, St. Joseph Diner, and Kids Across America. She is also a Spanish language tutor. Bayard plans to pursue a graduate degree in interpersonal/organizational communication. She is the daughter of Gustavo and Nadina de Bayard of Panama City, Panama. 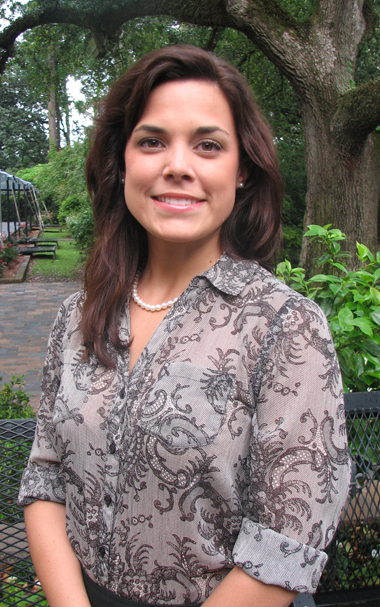 Lainey Landry is the Outstanding Graduate for the College of Education. She is an early childhood education major with a 3.927 GPA. 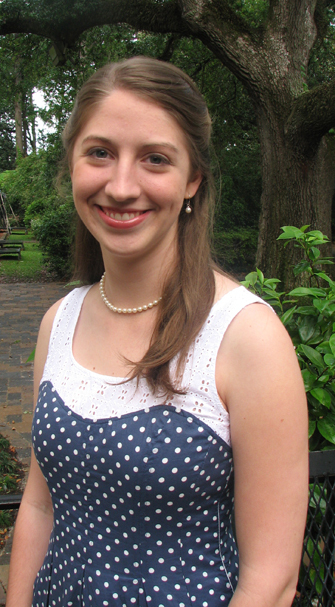 She has been on the President’s List and a member of the Phi Kappa Phi Honor Society. A member of the Phi Nu Chapter of Delta Delta Delta Fraternity, she earned the Sarah Ida Shaw Award, which is the most prestigious national collegiate award presented by Tri Delta. That award recognizes a collegiate member who best exemplifies the ideals of Tri Delta. This is the first time a Tri Delta member attending UL Lafayette has received the award. Landry also received the Kappa Delta Pi/Maxim D. Doucet College of Education Outstanding Senior Award. She has been a member of the University’s Student Government Association and Student Leadership Council. Landry has volunteered for Lafayette Habitat for Humanity, St. Jude Children’s Research Hospital, the Down Syndrome Society of Acadiana, the Autism Society of Acadiana, the Susan G. Komen Race for a Cure and Big Brothers, Big Sisters of Acadiana. She plans to teach in a local school, and eventually pursue a graduate degree in Educational Leadership from the University. Landry is the daughter of Liz B. and Ivy Landry of Lafayette. Brandon Plaisance is the Outstanding Graduate for the College of Engineering. He is chemical engineering major with a minor in mathematics. He will graduate with a 3.896 G PA.
Plaisance has been on the President’s List and Dean’s List, and is a member of the UL Lafayette Honors Society. He has been a member of several other honor societies, also, including the Omega Chi Epsilon Chemical Engineering Honor Society. He was a member of the Pride of Acadiana Marching Band, University Symphonic Band and Ragin’ Brass Basketball Pep Band. And, he has been named to the Who’s Who Among Students in American Universities and Colleges. Plaisance has volunteered for Lafayette Habitat for Humanity and with St. Anne’s Catholic Church. He plans to attend graduate school, with the goal of earning a doctoral degree in Chemical Engineering. Plaisance is the son of Darrel and Crystal Plaisance of Youngsville, La. Marcia Richard is the Outstanding Graduate for the College of Nursing and Allied Health Professions. She is a nursing major with a 3.66 GPA. She has been on the Dean’s List. Richard has been a member of the Sigma Theta Tau International Honor Society of Nursing, and the Phi Kappa Phi and Alpha Epsilon Delta honor societies. She has received a TOPS scholarship, Woodard Nursing Scholarship from the Louisiana Nurses Foundation, and the Association of Perioperative Registered Nurses Scholarship. 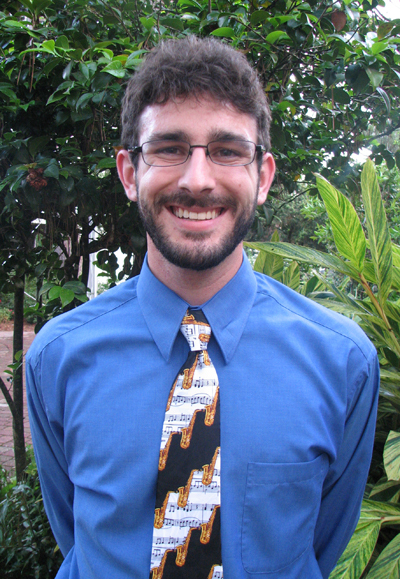 Richard has been a member of the University of Louisiana Student Nurses Association. And, she has been involved with community service efforts with the Boys and Girls Club of Acadiana. Richard plans to work at a local hospital and attend graduate school to become a certified registered nurse anesthetist. The Baccalaureate of Science in Nursing degree she has earned from UL Lafayette is her second college degree. In 2009, she earned a biology degree from Xavier University. She is the daughter of Philip and Cynthia Richard of Lafayette, La. 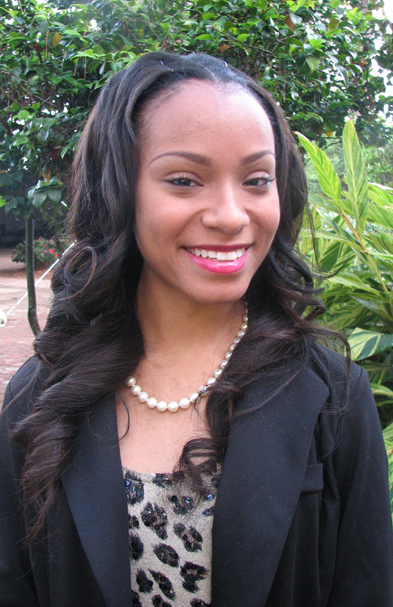 Kelsey Etheredge is the Outstanding Graduate for the Ray P. Authement College of Sciences. She is a chemistry major with a minor in biology. She has a 4.0 GPA and has been on the President’s List . Etheredge has been a member of the Phi Kappa Phi Honor Society, UL Lafayette’s Honors Program and the Student Advisory Committee. She has served as treasurer of the Pre Pre-Professional Society, and secretary of both the UL Honors Board and the Student Affiliates of the American Chemical Society. She has received the UL Lafayette Foundation Scholarship, Jefferson Caffery Scholarship, Centennial Valedictorian Scholarship, Distinguished Freshman Scholarship and the TOPS Honors Scholarship. 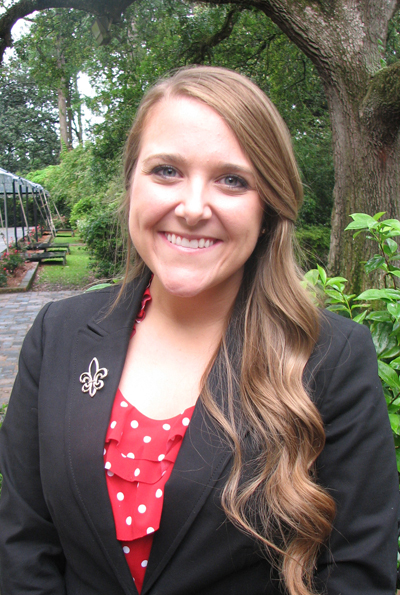 Her community service includes working with Miles Perret Cancer Services and Big Brothers, Big Sisters of Acadiana. She has also tutored an area elementary student. Etheredge plans to enroll in the Houston College of Optometry. She is the daughter of Jim Etheredge of Lafayette, La. and Nona Istre of Lafayette, La. Kelly McCarthy is the Outstanding Graduate for the College of General Studies. She is a general studies major and has maintained a 3.975 GPA. McCarthy has been named to the President’s List and Dean’s List. 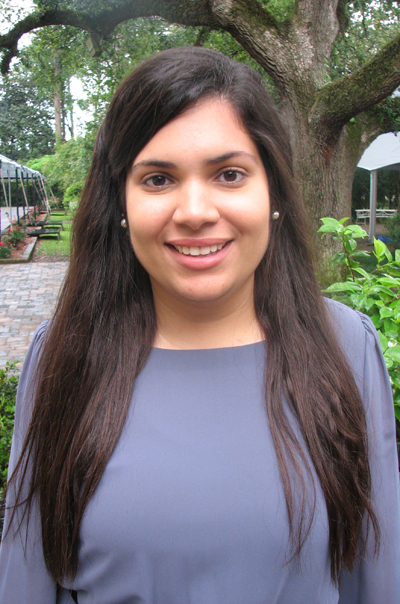 She has been a member of UL Lafayette’s Honors Program, and the Alpha Lambda Delta and Phi Kappa Phi honor societies. McCarthy received the UL Lafayette Academic Excellence Scholarship. She was awarded the Congressional Award Gold Medal, and named Who’s Who Among Students in American Universities and Colleges. She has been a member of Our Lady of Wisdom Student Leadership Team. Her volunteer work includes bringing breakfast to homeless in shelters, and serving as a Eucharistic minister at Our Lady of Wisdom Catholic Church. She plans to apply to the graduate theology program at Franciscan University of Steubenville in Ohio, with the goal of working for the Catholic Church. McCarthy is the daughter of John and Julie McCarthy of Baton Rouge, La. Elizabeth Rose is the Outstanding Graduate for the College of Liberal Arts. She is a communications/journalism major with a 3.85 GPA. She has been named to the President’s List. Rose has been a member of the Phi Kappa Phi and Blue Key honor societies, and received the Paul Dugas Memorial and Calvin Lear scholarships. She received the Segal AmeriCorps Education Award, and was editor of The Vermilion, the University’s student newspaper. Rose has won numerous journalism and writing awards, and has been a member of the campus chapter of the Society of Professional Journalists. She has volunteered with dozens of projects and organizations, including Habitat for Humanity, Rebuilding Together Acadiana, as a classroom aide and tutor at Alice Boucher Elementary School and with the Cinderella Project. Rose plans to pursue employment with a non-profit organization, and continue doing freelance journalism work. Rose is the daughter of William and Anne Rose of Lake Charles, La.